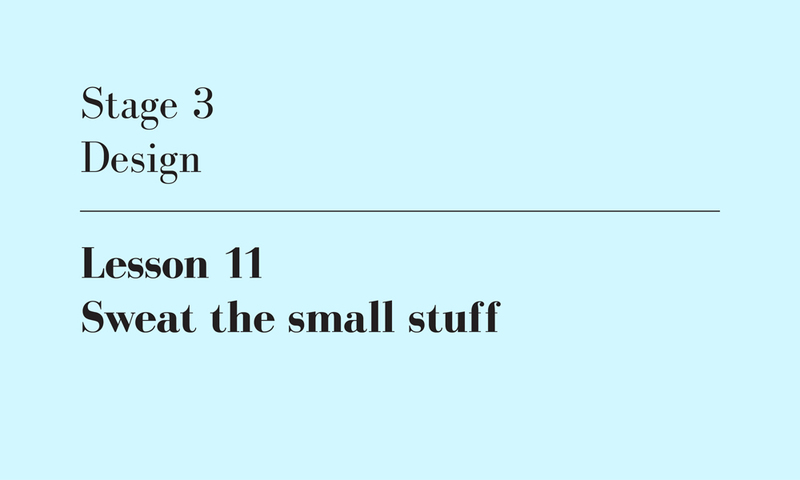 This is the 11th of twenty-one lessons for design students, gathered from the combined experience of being a student, and teaching students. I will published one lesson each weekday until they’re done. In the architecture studio I run with my wife, we believe that design doesn’t stop until the builder hands over the keys. I don’t think I ever would have predicted this of us when we were students, but we love detail. There is great satisfaction in channeling the aspirations of a sketch design into the exigencies of construction. Architecture is about building after all, and buildings are filled with small things. It is with detailing that the big ideas find expression in the things you hold and manipulate: doors, door handles, cupboards, drawers, towel rails, taps. It is also here that we get to produce really beautiful drawings, filled with 1:5 details exploring the tiniest of junctions. Unfortunately, this attitude towards detail is the opposite of what is typically taught at university. At university, you learn that real design means sketch design. Everything that happens afterwards is less important. But this is to ignore the long tradition of architects whose details were their forte: Gaudí, Wright, Aalto, Scarpa, Leplastrier, Zumthor, Stutchbury. It also ignores some of the best opportunities for your project to shine. I ask my students to think about joinery, bench seats, desks, storage, shelves, light fittings, handrails, balustrades, screens, tables and chairs. Instead of downloading SketchUp blocks of Eiffel Chairs (these days as ubiquitous as birds flying off in the distance), design something yourself. A chair or a handrail offers as much potential to express your ideas as does the building form. Indeed, by carrying the ideas of your form making into these details, you enliven your project and convince me you understand the human scale of architecture. Sweat the small stuff, author’s own image.